BODYCOMBAT is an energy-packed mix of martial arts moves that will get you fit, fast and strong – and leave you feeling fierce and empowered. BODYCOMBAT™ features a scientifically-backed combo of some of the most empowering and effective martial arts moves. The addition of motivating Instructors and amazing music is what pushes you to your true training potential. The workout is based on the science of Cardio Peak Training, which involves maintaining your heart rate at an aerobic training base (between 60 and 80 percent of your maximum heart rate) with interspersed peaks of intensity (pushing you to 85 to 90 percent of your max). This specific blend of steady-state and high-intensity builds cardio endurance, and also drives the transformative fat-burning effects associated with high-intensity interval training. 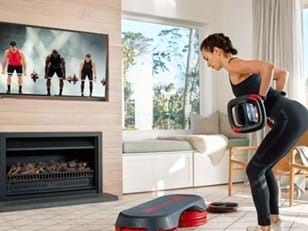 HOW MANY CALORIES DO YOU BURN DOING BODYCOMBAT? You can expect to burn around 740 calories* during a 55-minute BODYCOMBAT workout. You’ll also build cardio fitness, tone and shape the arms, back and shoulders, train your legs and condition your core. WHAT EXERCISES DO YOU DO DURING BODYCOMBAT? BODYCOMBAT features moves from Karate, Taekwondo, Boxing, Muay Thai, Capoeira and Kung Fu. But don’t fret, you don’t need any martial arts experience – during the warm up you’ll be coached through all the different movements. You can expect to power through invigorating sets of hooks, jabs and uppercuts, and there are plenty of kicks and high knees too. You’ll also benefit from functional training moves such as lunges, squats and push ups. DOES BODYCOMBAT REALLY GET RESULTS? Not only is BODYCOMBAT a calorie killer, it truly is a full-body workout that builds upper and lower body strength and delivers phenomenal core training. Research shows that, compared to the common crunch, moves such as front kicks and fast alternating jabs are superior – and the core training you get during a BODYCOMBAT workout is equivalent to 1700 crunches. In BODYCOMBAT there are options to suit every ability and your Instructor will coach you through all the moves. When you’re just starting out it’s a good idea to just do the first three or four tracks of the workout. And remember, it might take a few sessions for you to get a feel for it – but you’ll soon be hooked! HOW OFTEN SHOULD YOU DO BODYCOMBAT? For awesome results we recommend you do BODYCOMBAT two to three times a week. Add a couple of weights-based workouts and some core and flexibility training into the mix and you’ll shape and tone your body in no time. WHAT DO YOU NEED FOR A BODYCOMBAT WORKOUT? You don’t need any equipment. It’s a good idea to wear supportive shoes and comfortable workout clothes (avoid tight shorts as they can really restrict your moves). You’ll also need a drink bottle and a sweat towel. CAN YOU DO BODYCOMBAT WHILE PREGNANT? It’s not a good idea to do BODYCOMBAT while you’re pregnant. During pregnancy the release of hormones such as oestrogen and relaxin can result in joints being less stable – so the kicks in BODYCOMBAT may adversely affect the hip and pelvis. CAN YOU SUGGEST A SONG FOR BODYCOMBAT? HOW DO YOU BECOME A BODYCOMBAT INSTRUCTOR? 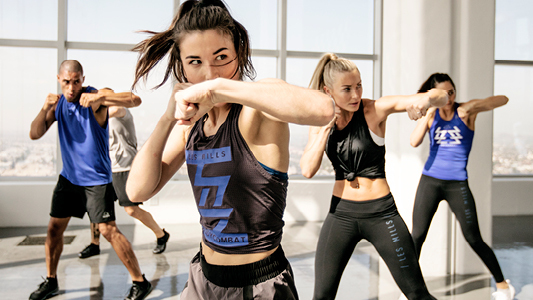 The first step to becoming a BODYCOMBAT Instructor is to connect with a club or your local Les Mills team. We’ll then provide you with plenty of training, you’ll get assessed and then you’ll be ready to lead your own classes. You can find out exactly what it takes to become a BODYCOMBAT Instructor here. WHERE CAN YOU DO BODYCOMBAT? You can find a BODYCOMBAT class near you here. 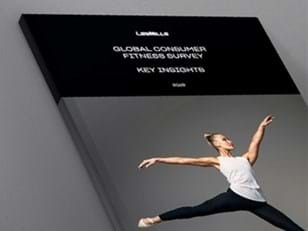 Alternatively, check out LES MILLS On Demand and do BODYCOMBAT anytime, anywhere.